Kampung Senang wish to engage volunteers (individuals of all ages, not limited to students but have to be at least 16 years old) to participate in Values in Action (VIA) learning experiences that support students’ development as socially responsible citizens who contribute meaningfully to the community, through the learning and application of values, knowledge and skills. Kampung Senang is an eco-conscious charity reaching out to serve all people regardless of cultural or religious background through compassion-filled charity programs and education on holistic environmentally friendly lifestyles. Established since 1999, its mission is “Lighting up Hope, Promoting Wellbeing to Care for People and Environment”. Volunteers are welcome to signup for its Flag Day event on 13 May 2017. 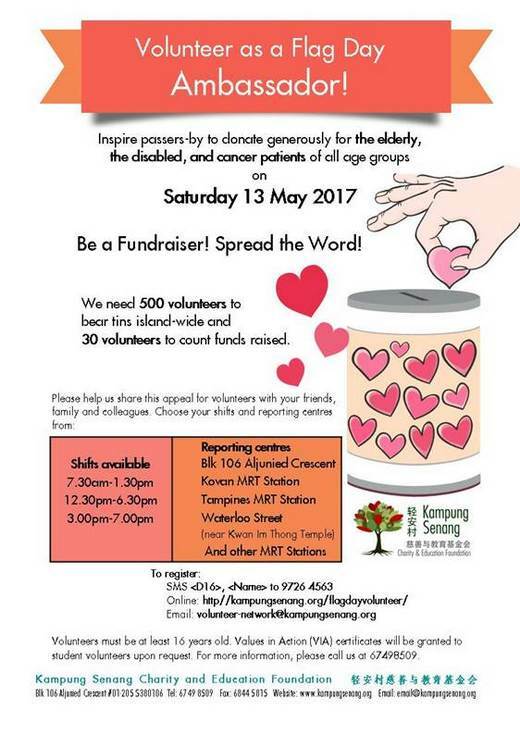 If you have any queries, please email volunteer-network@kampungsenang.org.